Cook pasta according to package directions. Drain, rinse and set aside. Meanwhile, trim the stem end of the broccoli stalks. Thinly slice broccoli stems. Separate florets into bite-size pieces. Heat 1 tablespoon oil in a large skillet over medium heat. Add pepper flakes, broccoli and 3/4 cup water. Cover and cook 5 to 7 minutes until tender but still bright green. Uncover and cook until liquid has evaporated, about 2 minutes. Whisk together remaining oil and water, vinegar, peanut butter and soy sauce in a medium bowl until smooth. 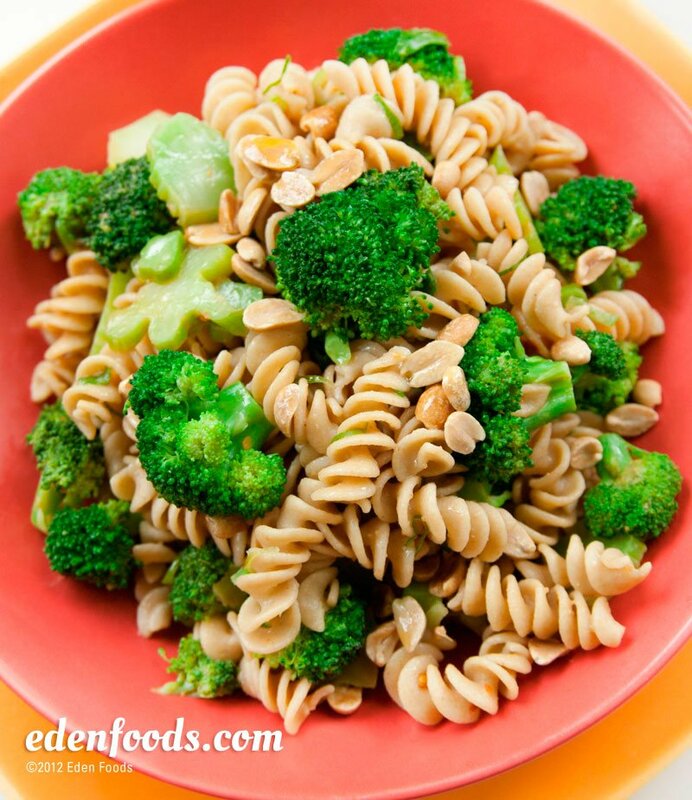 Add pasta, broccoli, scallions and peanuts. Toss. Serve immediately or refrigerate and serve chilled.